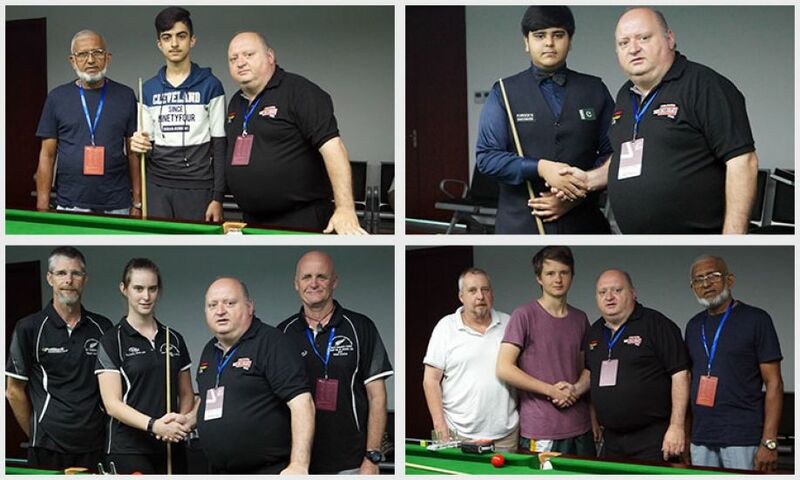 The International Billiards & Snooker Federation are holding IBSF Cue Zones every morning this week from the 5th – 10th of July at the 2018 IBSF World Under 21 Snooker Championships in the Qilu University of Technology Changqing Campus in Jinan, China. The IBSF European Head Coach PJ Nolan from Ireland is conducting free cue zones each morning from 10am – 1pm and the cue zones are aimed at promoting the IBSF Coaching and helping the players gain knowledge about improving their game and practice from an experienced International Coach. The cue zone schedule for the players to sign up is at the practice venue and it is all free of charge with the compliments of the IBSF. Jim Leacy IBSF Vice Chairman said the IBSF hope to make these Cue Zones a regular activity at all IBSF Championships in the future. On day 3 the 7th of July it featured players from Syria, Pakistan, South Africa and New Zealand when Yazan Alhadad from Syria, Muhammad Umar Khan from Pakistan, Stephanus Mundus Grove from South Africa and lady player Michaela Spencer from New Zealand attended. PJ worked on their Break Building, Developing good fundamentals in their Techniques. All the players really impressed PJ with their commitment and the players said they really enjoyed their lesson with PJ.